To make the chili paste for the Indian Mee Goreng, first take 10 dried red chilies and blend them together in a food processor. In order for the content to blend well, take some water and oil and add them into the blender. 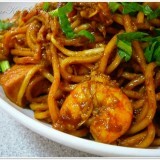 To begin cooking the Indian Mee Goreng, first you will have to heat up a wok and pour some oil into it. Now add in the garlic, sliced potatoes, squids, 3 tablespoons of the chili paste and bean curd pieces. Stir the ingredients together until they become fragrant, once that is done you can now add the yellow noodles and sauces into the wok, continue stirring. Set the cooked noodles aside, add some more cooking oil into the wok and then crack the eggs into it. Now mix the noodles together with the eggs, make sure to add the beansprouts as well. Keep on stirring for about 1 minute and you are done. 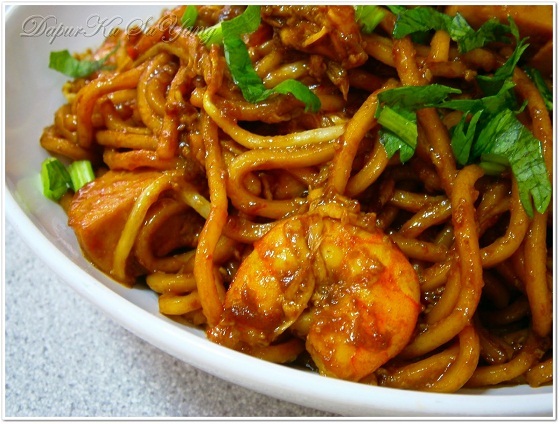 Before you serve the noodles, make sure to squeeze some lime juice into first.